The circumstances of her early life must have done a great deal to shape her philosophy. Her family commanded a comfortable income until her father, Edward John Wollstonecraft, squandered it away on speculative ventures. When the situation became dire, he compelled Mary to surrender the wealth she would have inherited as an adult. There are also reports that he was a drunkard and beat his wife. Mary assumed a protective role for her mother and her siblings against her father. She continued to play a protective and maternal role for her sisters Everina and Eliza throughout their lives. 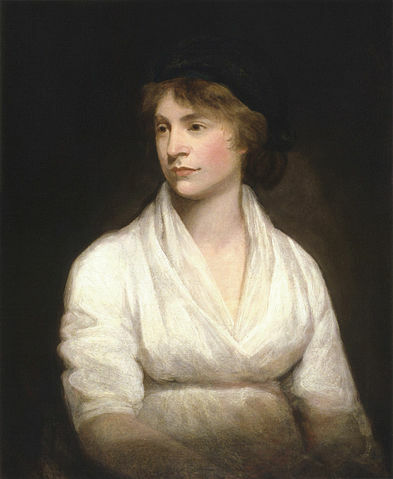 "For example, in a defining moment in 1784, she convinced Eliza, who was suffering from what was probably postpartum depression, to leave her husband and infant; Wollstonecraft made all of the arrangements for Eliza to flee, demonstrating her willingness to challenge social norms. The human costs, however, were severe: her sister suffered social condemnation and, because she could not remarry, was doomed to a life of poverty and hard work." While the outcome of that intervention might have turned out better, the episode established that Wollstonecraft was ready and willing to challenge prevailing social norms. In 1796, Wollstonecraft renewed an friendship with William Godwin. They became lovers but declined to marry since they both opposed the marriage laws of that time (which conferred rights upon the man but stripped them from the woman). When Wollstonecraft became pregnant, they reconsidered and decided to marry. Sadly, Wollstonecraft developed septicemia or "childbed fever" and was dead within two weeks of giving birth. Her daughter, raised by William Godwin, eloped with the poet Percy Bysshe Shelley and is known to modern readers as Mary Shelley, the author of the gothic novel Frankenstein. The following biographical sketch is excerpted from a later edition of A Vindication of the Rights of Woman: with Strictures on Moral and Political Subjects (1792).